Yellowstone-area grizzlies are still recovering from near-extinction, and have yet to reach a population large enough to guarantee their long-term survival. Yet, the Wyoming Game and Fish Department is proposing to allow trophy hunters to kill (and in some cases bait) up to 24 grizzlies in areas near Yellowstone and Grand Teton National Parks. NRDC is calling on Wyoming Governor Matt Mead to reject this foolish plan. Tell Governor Mead that you’re outraged by the Wyoming Game and Fish Department’s decision to allow grizzly hunting and urge him to put an end to it, before it’s too late for two dozen bears. The Wyoming Game and Fish Department is proposing to allow grizzly bear trophy hunting, despite dangers like climate change and conflicts with humans that already threaten grizzlies. 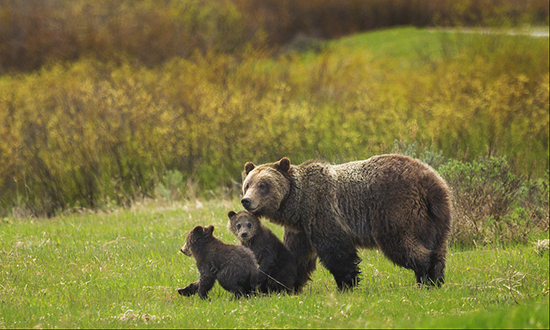 Tell Wyoming Governor Matt Mead to reject this senseless and misguided hunting plan and save Yellowstone-area grizzlies. Dear Governor Mead: I urge you to put a stop to the Wyoming Game and Fish Department's plan to allow the hunting (and in some cases baiting) of grizzly bears in your state. Not long ago, Yellowstone-area grizzlies were on the verge of extinction. With the help of the Endangered Species Act, the population has rebounded. But they have yet to recover enough to guarantee their long-term survival. This hunting plan could prevent any further progress. The U.S. Fish and Wildlife Service removed Endangered Species Act protections from grizzlies just last year. The bears still face a range of threats, including climate change, conflicts with humans, diminishing food sources, isolation, and habitat loss. Wyoming should follow Montana's lead and help grizzlies continue to recover -- not make matters worse by hunting and baiting them. Killing grizzlies that may have just wandered out of Yellowstone or Teton National Parks isn't going to prevent conflicts and will only put more people, and bears, in harm's way. NRDC stands ready to work with Wyoming landowners and wildlife managers -- as it has in many other states -- to protect property and livestock from grizzlies. But we cannot stand by and allow Yellowstone grizzlies to be destroyed by hunters -- just for the sake of sport. You must put a stop to this senseless plan and protect the Yellowstone grizzly.